The V-SUB is an actively driven high performance cardioid subwoofer powered by a single amplifier channel. The V-SUB features integrated rigging equipment, and shares the same acoustical and visual design as the V-GSUB, which is intended for ground stacked applications only. It houses two long excursion neodymium drivers, an 18″ driver in a bass-reflex design facing to the front and a 12″ driver in a two chamber bandpass design radiating to the rear. The cardioid dispersion pattern resulting from this approach avoids unwanted energy behind the system that reduces the reverberant field at low frequencies and provides the greatest accuracy of low frequency reproduction. The V subwoofer can be used to supplement V8 and V12 loudspeakers in various combinations, ground stacked or flown, either integrated on top of a V8 / V12 array or as a separate column. The V-SUB cabinet is constructed from marine plywood and has an impact and weather protected PCP (Polyurea Cabinet Protection) finish. 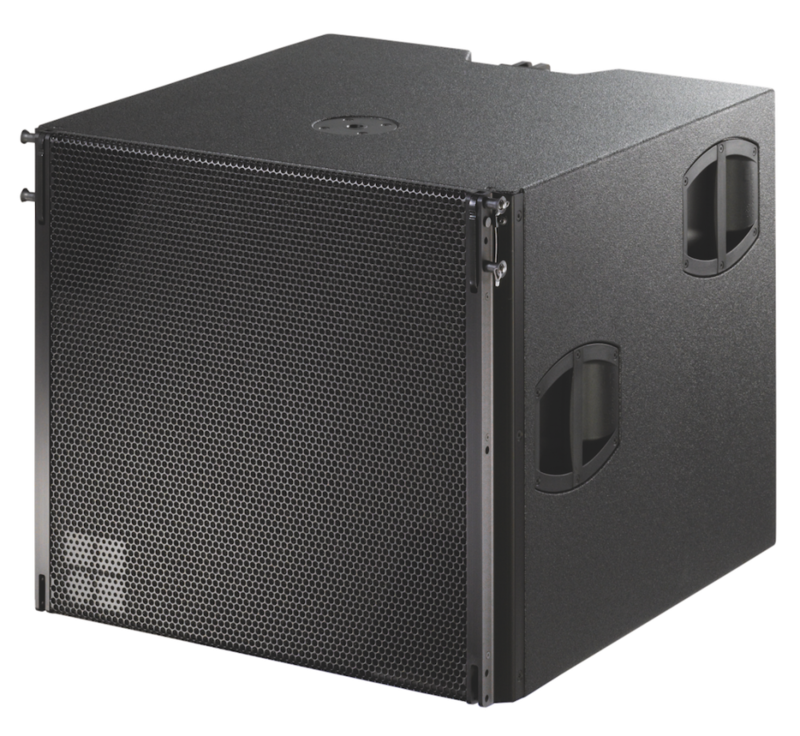 The front of the loudspeaker cabinet is protected by a rigid metal grill backed by an acoustically transparent foam. Each side panel incorporates two handles, whilst the top panel has an M20 high stand flange inserted.